The Global Fund’s partnership with Heineken was a hot topic of conversation the past couple of weeks on blogs and in the Twittersphere. A member of the Global Fund Board from Norway announced that he was opposed to the partnership. “The Norwegian authorities cannot support this type of partnership with an alcohol company. This is not compatible with our development policy,” he said. Peter Sands will assume his new duties as Executive Director of the Global Fund in mid-March. Meanwhile, Sands has given an interview with Devex, and spoken at a conference in Bangkok. Sands touched on several topics, including taxes in implementing countries; innovative finance mechanisms; the three diseases; and global health security. In the process, Sands has raised issues that suggest he may be getting ready to take the Global Fund in some new directions. An investigation conducted by the Office of the Inspector General found that medicines worth almost $200,000 bought using funds from two Global Fund grants were lost due to theft and leakage at a central warehouse managed by a principal recipient in the Central African Republic. The medicines consisted mostly of artemisinin-based combination therapies, but there were also some antiretrovirals. In addition to a large theft in the fourth quarter of 2016, small quantities of medicines regularly went missing over the 17-month period covered by the investigation. The PR, the International Federation of Red Cross and Red Crescent Societies, took issue with some of the OIG’s findings. An investigation by the Office of the Inspector General has identified $62,557 in non-compliant expenditures in a TB grant to Kenya. The expenditures stem from irregularities related to training events and other meetings. Two employees of the National TB, Leprosy and Lung Disease Program, the agency implementing the grant, have been disciplined. Staff from the National Tuberculosis Control Program in Bangladesh falsified documents to support training-related expenditures, according to an investigation conducted by the Office of the Inspector General. The NTP is principal recipient for a TB grant. This is not the first time that it has come under scrutiny. If U.S. President Donald Trump had his way, $425 million would be cut from the United States’ planned $1.35 billion contribution to the Global Fund for the next fiscal year, 1 October 2018 to 31 March 2019. All told, the administration’s proposed budget contains cuts of over $1 billion for global AIDS programs, but it has little or no chance of becoming law. In what may be its final TB and HIV grants from the Global Fund, Thailand aims to boost services for key populations. It will also improve sub-national planning and provincial coordination of HIV and TB programs as part of Thailand’s preparation for transition. The Board approved the grants in December 2017 after Thailand revised and resubmitted its TB/HIV funding request. The Wits Health Consortium will continue in its role as principal recipient for the Southern African Regional TB in the Mining Sector Program, thanks to the renewal of a multi-country TB grant. TB prevalence in mining areas is 3–7 times that of the general population. When President Trump took office, one of his first actions was to reinstate the Mexico City Policy, also known as the “global gag rule.” The policy, invoked by every Republican administration since 1984, requires that foreign NGOs receiving U.S. funding for family planning programs not use their non-U.S. funding to provide abortion services, or even present abortion as one of the options. But Trump extended the reach of the policy to cover all forms of health programming, not just family planning. Many outreach programs provided by NGOs have had to close. In our first “OF INTEREST” feature, we draw attention to an article from IRIN, the humanitarian news agency, on the challenges of providing HIV services in a conflict zone in Eastern Ukraine; and an article on the website of International Health Policies on roadside drug vendors in Cameroon. We plan to include OF INTEREST features in GFO from time to time. Applicants from 55 countries on multiple continents are eligible to respond to two calls for proposals launched by the 7% Initiative. The initiative, which provides technical assistance, has budgeted €10 million for projects funded through the calls. An investigation by the Office of the Inspector General (OIG) into a TB grant to Kenya has identified $62,557 in non-compliant expenditures. A report on the investigation was released on 9 February 2017. The principal recipient for Grant KEN-T-TNT was the National Treasury, but the implementing agency was the National TB, Leprosy and Lung Disease Program (NTLDP), part of the Ministry of Health (MOH). The implementation period for this grant was 1 October 2015 to 31 December 2017. The value of the grant was $93.9 million, of which the Global Fund has disbursed $47.9 million. 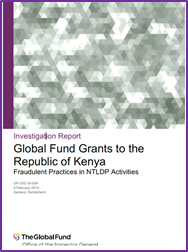 At the time of the audit, the Global Fund had five other active grants in Kenya. In October 2016, the OIG received an allegation regarding misuse of funds from an external source. In February 2017, a local fund agent (LFA) review of 2016 training expenditures, requested by the OIG and the Secretariat, also suggested potential fraud. As a result, the OIG launched an investigation. the OIG found evidence that a number of people (17) had received per diems although they had not attended any activities. The investigation identified two employees of the NTLDP whose signatures were on the payment schedules for the above activities. The two employees were “imprest holders” (i.e. cash account managers). Of the 120 people whose attendance could not be confirmed, 88 identified themselves as MOH staff on the activity registration or payment sheets. However, the OIG said, none of them are included in the MOH staff database. With respect to one particular training event and a quarterly review meeting, the NTLDP did not provide expenditure records despite multiple requests, the OIG reported. In response to the investigation findings, the National Treasury, the MOH and the NTLDP agreed to impose disciplinary measures on the two employees and to recover funds from them. Up to the time the investigation report was prepared, $11,932 had been recovered. Since October 2016, when the OIG received the allegations of misuse, the Secretariat instructed the National Treasury and the NTLDP to implement appropriate measures to address the risks relating to the use of an imprest system to pay cash advances. The National Treasury seconded a senior accountant and appointed an additional internal auditor. In addition, county coordinators are required to submit in advance the names of their nominees to attend training events and meetings. The OIG reported that the use of imprests has been reduced. As of May 2017, over 70% of payments of per diems and transport allowances are made using electronic funds transfer. As well, the Secretariat facilitated an in-country workshop to further sensitize program staff on risk identification and mitigation. In response to the findings of the investigation, the Secretariat said that it and the National Treasury would ensure compliance by the NTLDP on internal controls, including ensuring that program activities are attended by the right participants. During its assessment of the allegation received in October 2016, the OIG learned that the Secretariat had received a report in June 2016 from the LFA identifying signs of fraud in various 2015 NTLDP activities. The Secretariat sought an explanation from the National Treasury and the NTLDP regarding these concerns, which prompted the NTLDP to conduct its own investigation. In September 2016, the NTLDP sought disciplinary action from the MOH against the individuals involved in the misappropriation of funds. The individuals refunded most of the amounts to the TB program. statements of findings from the investigation. Both parties responded to the OIG’s findings within the agreed timeframes. The OIG said that it duly considered all points made by the respondents and that appropriate revisions were made to its findings in this final report. The OIG reported that according to the NTLDP, one person changed the answer provided to OIG of “no attendance” and subsequently confirmed attendance of the activity in question. However, the OIG maintains that this person did not attend the activity given his initial answer and the fact that the relevant county coordinator told the OIG that the person had not received an invitation for the activity. None of the other OIG findings were disputed. Aidspan invited the National Treasury to comment on a draft of this article and on the OIG audit itself. We had not received a response by the time we went to press. On 1 December 2017, the Board approved a TB grant for Kenya from the 2017–2019 allocations in the amount of $30.0 million, with the National Treasury as PR. The Board also approved five other grant to Kenya, including an HIV grant and a malaria grant with the National Treasury as PR.